As a Nuby Mommy Blogger, I receive product for review. My opinion is my own. My guy was able to try the Nuby Glow In the Dark Pacifiers. He's below being silly and showing off the yellow one. The pack of two came with the yellow one and a green one. 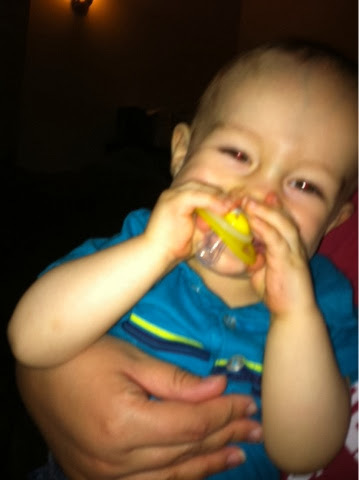 The paci is a great size for my breastfed baby and he likes to chew around all the edges while teething too. The loop or "handle" on the paci is glow in the dark, so I can find it at night when baby throws it across the room or drops it in the crib.